Come view our two acres of lavender in glorious purple and visit our farm shop with numerous hand made items. See our esssential oil distillation process and sample the subtle perfume. 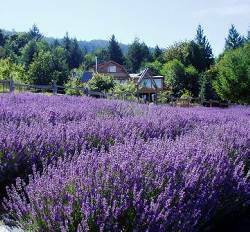 Be sure to note our Lavender Festival on Salt Spring held at the farm July 5th 2009. May 1 Sep 30 Wed, Thur, Fri, Sun 10am to 4pm. Otherwise by . Open Saturdays in July & Aug.